$5.37 New In stock! Order now! Short Description: Hanes Boys' Crew ComfortBlend® Assorted Socks 6-Pack Style # 431/6 Available in Assorted Colors; (White & Black). Just what boys need in a sock, more cushioning! 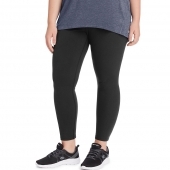 Crew style for active sports. 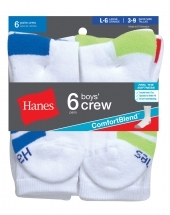 EZ Sort® sock matching system with the Hanes logo on the toes makes sorting socks so much easier! Comfort toe seaming, our most comfortable seam ever. Assorted 6-pack can include 3 solids and 3 pattern. Cotton, Polyester, Natural Latex Rubber & Other Fibers.